I finished a baby quilt and a full sized quilt this week. I am supposed to have my star quilt UFO done but alas it is not finished…and Nell who challenged me doesn’t have hers finished either. Let’s shoot for March 1st. Maybe by then I’ll have a few more “secret” projects off the list and I can do my own things then. Here’s the sneak peak at the magazine quilt…..
..and here’s a sneak peak of the baby quilt. It’s kind of sad to have accomplished so much yet I can’t really show any of it!! Both times I am binding by machine. I got lots of questions on how to do that. Here is a tutorial I did long ago that answers many of those questions. After seeing Judy at Patchwork Time’s tutorial, I have changed the way I pin. I now put the pins in like Judy does. You can see her video here. I recently ran across a tutorial at Cluck, Cluck, Sew. She has yet another method that you can see here. There are LOTS and LOTS of people who think binding by machine is a sin. Lucky for me, I am not one of them as I am not a fan of hand binding. I know many enjoy it. Honestly, by the time I done quilting a quilt…I am ready to be done with it. 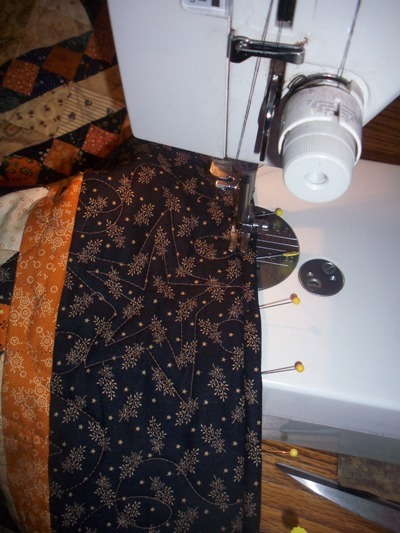 I get questions all the time from people asking how I can finish so many quilts…machine binding is one way. I can do a big queen sized quilt in under two hours. I was also asked about what size of binding strips I use. On large bed or throw quilts that will be used a lot, I use 2 1/2 inch binding. On wall hanging I use single fold and only use 1 3/4″ strips. Here is a tutorial on how I bind wall hangings. Everyone can bind however they wish…this is just me answering some questions that were asked. This entry was posted in Finished Projects, Quilting on February 15, 2013 by Jo. I also do all my bindings by machine. I do not like to do any hand sewing. I use 2 1/4 inch bindings. Thanks for sharing the binding links. i like both of those quilts! will be eagerly looking forward to the magazine publications of them. any chance you could tell us which fabric line you used in the brown and gold? I also do all my bindings by machine. I feel like they are sturdier for repeated washings since quilts are meant to be used. I also do my bindings by machine using JudyL’s method. With careful in-the-ditch sewing they look every bit as good on the front as hand binding. Plus, my hands really don’t like doing binding by hand anymore. Too painful. Yes sad you can not show them off yet. I understand. I have made gifts, done quilts for show ect and can not show them. Both quilts look great, very pretty. Thank you for the links on the machine binding. I look forward to trying it.